There are so many good reasons to stop stalling the launch of your online business. Driven by consumer demand, all sectors in the business world are adopting online technology at an overwhelmingly fast pace. It's not just Millenials favouring high-tech over the time consuming traditional options of bricks and mortar retail shopping. The driving demand is fueled equally across all demographics, and especially evident with the increased popularity of smart technology. We are all time poor, and a smartphone will allow us to complete all of our shopping needs - from groceries to high street fashion on the way to work, all online from the comfort of your bus seat. Online stores have evolved to meet an increasingly demanding consumer base. A shopper can now feel more at ease throughout their online journey with the offering of fast and secure checkout, data cross matching, transparent consumer ratings and so much more. Conversely, the improved handling of logistics, from storing and packaging products to tracking and final delivery, has reinforced consumer trust. According to Gulf News, the global B2C (business to consumer) e-commerce spending topped $3.8 trillion last year. As for the UAE, it is expected that throughout 2018, the e-commerce market will hit $10 billion, a figure that increased exponentially since 2014, when the value of online trading was $2.5 billion. Artificial Intelligence and Financial Technology stole the show in the UAE for a good while in late 2017. The integration between technology and banks and the incorporation of high tech software into companies has, if anything, boosted the consumer’s trust in digital trends. Given the security online companies provide to the consumer’s details, digital wallets have become the more appealing and safer option, not to mention faster. Thanks to Fintech services, people today have more access to their bank accounts than they used to in the past. In order to protect people’s money, online companies innovated techniques, like fingerprints and facial recognition features, to guarantee secure payments over the internet. Internet Penetration is the percentage of internet users in any specific region. The rate of the global internet penetration has increased rapidly and is predicted to reach 49% by the year 2020. There is a direct relation between internet penetration rate and the proliferating use of smartphones and tablets. Statistics show that the total number of internet-enabled mobile devices worldwide is expected to grow from 4.4 billion in 2016 to 6.7 billion in 2020. To shed more light on the UAE, a report by AWOK showed that just last year, 80% of the online retailer’s customers shopped online. This has caused a huge rise in the online buying as smartphone mobiles and tablets give people the chance to shop and buy on the go. Smart Economy, Smart Living, Smart Governance, Smart Environment, Smart People and Smart Mobility dimensions are what the Smart Dubai Initiative aims to make happen. The initiative will help accelerate the growth of ecommerce in the UAE. The Smart Dubai Initiative is mainly concerned with making the emirate and the people living in it the 'Happiest on Earth'. Ecommerce will duly play its role by introducing the best shopping solutions to the consumer. The above three factors are challenges to some and opportunities to others. They pose a threat to physical retailing stores. Brick and mortar shops are being gradually beaten by click and order and thus shop owners will have to find a way to save their businesses. Some opt for the wise brick and click option, which is the way to keep the physical presence of a business but still keep up with the technological progress in the world, driving customers back. However, the significant predicted growth in ecommerce is a huge opportunity for entrepreneurs looking to starting a low cost business in Dubai. 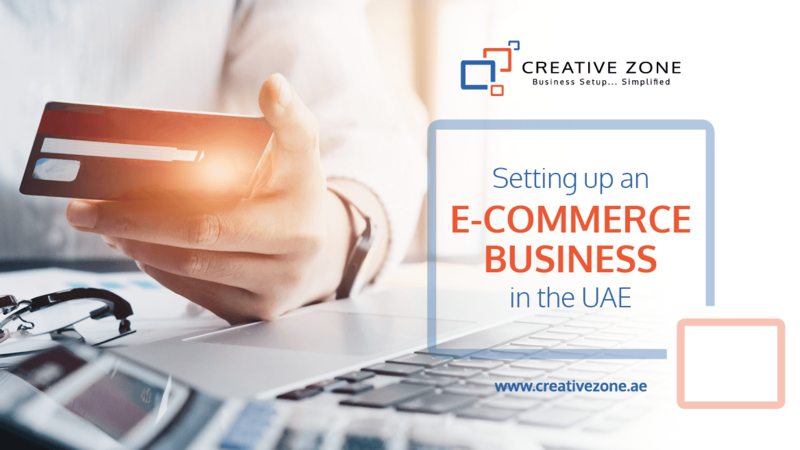 There are many options available for entrepreneurs who are seeking to start their own ecommerce business in Dubai. The first step is to review the pros and cons for each option. A Dubai Mainland license is issued by DED (Department of Economic Development Dubai). The main aspects that differentiate DED from Free Zones is that with a DED license you will have a direct access to the local UAE market, which means you will be allowed to exercise your business activity in the mainland area. You will also have flexible options to rent a physical space within the mainland area, either as an office or to store products, depending on the type of business you will run. However, one of the main reasons that drive entrepreneurs away from DED license and more commonly with expatriates, is the requirement of a local partner or a local service agent. As for the Free Zone license, the major disadvantage is you can only practice your business activities within the Free Zone. On the other hand, a Free Zone license means full ownership of your business, full repatriation of profit and exemption of export and import duties. In case you are indecisive about which type of license suits your business plan best, consult a company formation specialist for a complete overview of each option. Aside from the e-commerce license process, business setup advisors can can also explain and assist with the legalities and of importing and storing goods. As mentioned earlier, the improved logistics online shops provide is the main influencing factor to the ecommerce boom. With an efficient logistics strategy, you can guarantee happy and returning customers. Once you have the business license and logistics finalised, you must then focus on marketing your company. Our next article will focus on marketing options for your new business in the UAE.